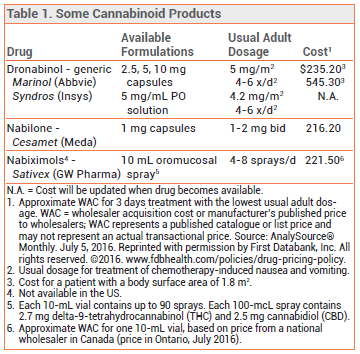 Cannabis and Cannabinoids | The Medical Letter, Inc.
8/17/16: Table 1 has been added. Two oral prescription cannabinoids are available in the US. Dronabinol (Marinol, and generics) is a synthetic form of delta-9 tetrahydrocannabinol (THC), the main psychoactive constituent of cannabis; it is classified by the DEA as a schedule III controlled substance (less potential for abuse or addiction than schedule I or II drugs; currently accepted medical use). A liquid formulation of dronabinol (Syndros) was recently approved by the FDA. Nabilone (Cesamet) is a synthetic analog of THC; it is a schedule II controlled substance (high abuse potential; currently accepted medical use). Both dronabinol and nabilone are approved for treatment of nausea and vomiting associated with cancer chemotherapy. Dronabinol is also approved for anorexia associated with weight loss in patients with AIDS. Nabiximols, a standardized cannabis extract that contains a mixture of THC and cannabidiol (CBD), another major cannabinoid found in cannabis, is not available in the US, but it is widely available in Europe and in Canada in an oral mucosal spray formulation (Sativex) for treatment of cancer pain and multiple sclerosis (MS). INTRACTABLE CANCER PAIN — A randomized, double-blind, placebo-controlled, 5-week trial in 360 patients found that adjunctive use of low (1-4 sprays/day) and medium (6-10 sprays/day) doses of nabiximols oromucosal spray was significantly more effective than placebo in relieving intractable cancer pain and comparable to placebo in adverse effects. High doses were less effective and caused more adverse effects.5 There are no acceptable studies on the effectiveness of cannabis for this indication. ADVERSE EFFECTS — Dry mouth, sedation, orthostatic hypotension, ataxia, and dizziness occur frequently with medical use of both cannabis and synthetic cannabinoids. Anxiety, tachycardia, agitation, and confusion are also common, especially in older patients, and driving may be impaired. Cannabinoids can cause sedation, motor dysfunction, altered perception, cognitive dysfunction, and dose-related psychosis. Pure CBD, however, does not have psychoactive effects. Death from an acute overdose of cannabis used alone has not been reported. CONCLUSION — The cannabinoids dronabinol (Marinol, and generics) and nabilone (Cesamet) are effective for treatment of chemotherapy-induced nausea and vomiting, for which they have been approved in the US. Cannabinoid products may also be effective for second-line treatment of cancer pain and the neuropathic pain and spasticity of multiple sclerosis, but none are currently approved for these indications. Cannabidiol (CBD) alone, which is not psychoactive, may be effective for treatment of epilepsy, but more documentation is required. No adequate studies of cannabis (botanical marijuana) are available for any of these indications. National Conference of State Legislatures. State medical marijuana laws. Available at www.ncsl.org/research/health/state-medical-marijuana-laws.aspx. Accessed July 21, 2016. G Wilkie et al. Medical marijuana use in oncology: a review. JAMA Oncol 2016; 2:670. RK Portenoy et al. Nabiximols for opioid-treated cancer patients with poorly-controlled chronic pain: a randomized, placebo-controlled, graded-dose trial. J Pain 2012; 13:438. KP Hill. Medical marijuana for treatment of chronic pain and other medical and psychiatric problems: a clinical review. JAMA 2015; 313:2474. V Yadav et al. Summary of evidence-based guideline: Complementary and alternative medicine in multiple sclerosis: report of the guideline development subcommittee of the American Academy of Neurology. Neurology 2014; 82:1083. O Devinsky et al. Cannabidiol in patients with treatment-resistant epilepsy: an open-label intervention trial. Lancet Neurol 2016; 15:270. D Friedman and O Devinsky. Cannabinoids in the treatment of epilepsy. N Engl J Med 2015; 373:1048. Committee on Obstetric Practice. The American College of Obstetricians and Gynecologists. Committee Opinion: Marijuana use during pregnancy and lactation. Number 637, July 2015. Available at: www.acog.org. Accessed July 21, 2016. RL Hartman et al. Controlled cannabis vaporizer administration: blood and plasma cannabinoids with and without alcohol. Clin Chem 2015; 61:850.